Where is the Best Place to Buy a Drone? When you start drone shopping there are a few different places to look, and there are some advantage and disadvantages depending on where you buy. There are a few different places we would recommend to shop for your drones: Amazon, Banggood, GearBest, Tomtop, and DJI. Amazon is probably our favorite place to do drone shopping. The selection is one of the best and they have a wide variety of accessories as well. Amazon has an excellent selection of beginner drones, as well as aerial photography drones. If you are looking to get an aerial photography drone then Amazon is definitely the place to buy. Plus you can pick up things from your non-drone shopping list while you are at it. Prime service adds extremely fast shipping, and you can often get what you want in a day or two. Amazon’s return policy is very good and their customer service is excellent. Buying from second party sellers can be a mixed bag, but Amazon typically does a nice job of making sure you are satisfied. DJI makes some of the best drones on the planet and you can buy directly from them. If you are looking for a Phantom, Mavic or Inspire then definitely check out DJI.com. Obviously, you are limited to only their drones, but if that is what you are looking for then it certainly is a good place to start. Unless DJI is having a sale then buying from them directly will not necessarily save you money. It is definitely a good idea to check the Amazon price as well. The DJI Phantom, Mavic Pro, Spark and Mavic Air are all excellent drones. 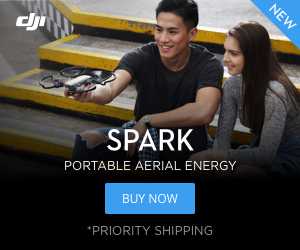 You can also get some DJI accessories from them that you might not be able to find elsewhere. The OEM accessories direct from DJI are expensive and you can often find good quality accessories from third-party vendors inexpensively on Amazon. One thing we love about DJI is their refurbished products. You can often get refurbished drones at quite a discount directly from DJI. We have had good experiences with refurbished DJI products. They look and fly just like new and come with the same DJI warranty. We have had a good experience with DJI customer service. They are willing to work with you, friendly and easy to communicate with. New DJI drones are released on their website before they are sold elsewhere. Banggood is the second place we go when we are looking for a drone or accessories. Banggood typically gets new drone releases before Amazon does. We like their FPV and micro FPV selections more than Amazon, especially when it comes to getting an all-in-one or BNF version of a drone. Banggood is also typically more inexpensive than Amazon. The biggest drawback to Banggood is that shipping can take a while. These drones ship directly from China and that can take weeks. Bangood has a new upgraded shipping option that can speed up shipping, but that seems to be a mixed bag. The expedited service speeds up shipping from 7-25 business days to 7-12 business days. We have gotten some things quickly, but not others. Banggood has an excellent selection. Banggood customer service is decent, but definitely not on par with Amazon. We have gotten refunds on poorly shipped items without issue, but when it came to returning a faulty drone we had to pay to ship it back to China and that wasn’t cheap. Another downside to Bangood is their less trustworthy reviews. Most products get 5 stars and that’s just hard to believe. You will need to rely on credible sources like Half Chrome to get the real picture of how a product will perform. Overall Banggood is a good source for drones and accessories, but we would recommend Amazon for large purchases. GearBest is very similar to Banggood. The prices on GearBest are also typically lower than Amazon, but they do not have the same selection. GearBest and Banggood usually have similar drones, but do carry slightly different inventories. GearBest has a nice selection of FPV and micro FPV quads. GearBest has a growing selection of drones and parts. Like Bangood, shipping from GearBest can take a while, but they too have an expedited service that is relatively inexpensive. We haven’t had any personal experience with GearBest’s customer service as all of our orders have worked out well. A quick internet search will tell you that some people have great experiences and other have poor ones. We suspect that customer service is a mixed bag, similar to Bangood. TomTop is quickly becoming an excellent place to shop for a new quad. TomTop is quickly becoming one of the better places for inexpensive drones. 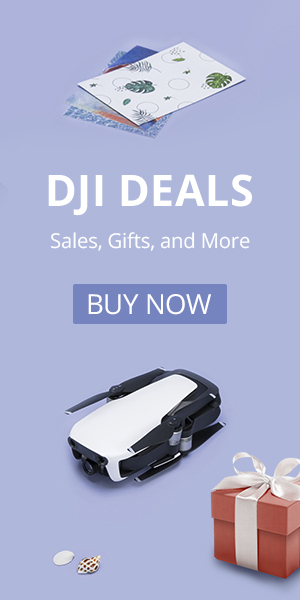 While we would probably go to DJI or Amazon for big quads like a Mavic or Anafi TomTop has an excellent selection of toy and hobby grade drones. Like Banggood and GearBest most of their drones will be shipping from China so don’t expect to get them the next day. Geekbuying is another distributor based in China. They sell all kinds of electronic equipment. They are very similar to both GearBest and Banggood in that the biggest issue is the shipping time. Their customer service ranks fairly well. We haven’t had any issues ordering from them, so our we have no personal experience dealing with returns. RC Moment is a new player in the game. They are a spin-off from the reputable TomTop site. The sole focus of RC Moment is RC products which is refreshing. We believe that over time they will continue to grow as they focus more on the RC market. We haven’t had any issues ordering with RC Moment, but reviews seem to indicate that if they have a product in stock it ships quickly. However, their stock does seem to be limited. Hopefully, they continue to grow and their focus on RC products helps them in the marketplace. These are the places we go to get our drones and drone accessories. There are a few other options out there. There are a few big box stores that carry drones, but their salespeople generally know little to nothing about the drones. There are a handful of hobby stores that carry drones and brick-and-mortar stores that are dedicated to drones are a rarity. The 312UAV Drone Store was one example but it was a single Chicago-based store. Sadly Stan has closed the doors and is now focusing on videography. Stan, the owner of 312 UAV. Good Venture Drones is a company that builds premium level race quads. So you are looking for an awesome quad, but don’t have the time or knowledge to build it yourself you should definitely check them out. You could search the newspaper or Craigslist, but you never know what you are going to get. Our recommendation is to start with Amazon and check the other online stores. Weigh your options and use PayPal when you can. Good luck shopping and happy flying. The guys at Good Venture Drones are real pros. Of course, you could search the newspaper or Craigslist, but you never know what you are going to get. Our recommendation is to start with Amazon and check the other online stores. Weigh your options and use PayPal when you can. Good luck shopping and happy flying.